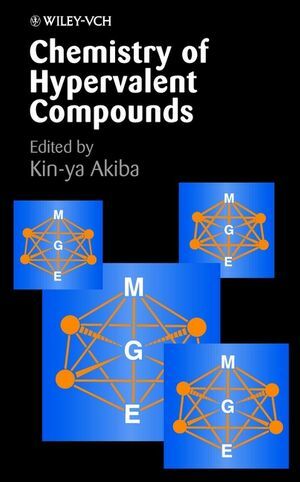 Broad, comparative coverage of hypervalent compounds -a much-needed foundation in a rapidly growing field of chemistry. Although hypervalency is already a mature field in chemistry, it has seen a new surge of interest in recent years due to the discovery of compounds useful in organic synthesis, as well as others with significant applications for materials science. Now, this comprehensive book-written by a group of twenty leading experts in the field-provides an authoritative blueprint on the subject. Instead of focusing on compounds specific to one element, it presents a review of structure and reactivity among an extensive array of main group, organic, and organometallic hypervalent compounds. In so doing, the book offers essential information on underlying principles that unify seemingly unrelated families of main group element compounds. * A systematic approach using the N-X-L designation, where N represents the valence electrons of the central atom X, and L the ligands that bond the compound. KIN-YA AKIBA, PhD, is a professor in the Department of Chemistry at Hiroshima University in Japan. Structure and Reactivity of Hypervalent Organic Compounds: General Aspects (K. Akiba). Characteristic Properties of Hypervalent Compounds: Static and Dynamic Structures of Sb(III), Sn(II) and Ge(II) Halides (K. Yamada & T. Okuda). Structure and Reactivity of Hypercoordinate Silicon Species (C. Chuit, et al.). Hypercoordinate Silicon Species in Organic Synthesis (M. Kira & L. Zhang). Synthesis of Hypervalent Organophosphorus Compounds and Their Reactions (T. Kawashima). Hypervalent Sulfuranes as Transient and Isolable Structures: Occurrence, Synthesis, and Reactivity (J. Drabowicz). Structure and Reactivity of Hypervalent Chalcogen Compounds: Selenurane (Selane) and Tellurane (Tellane) (N. Furukawa & S. Sato). Ligand-Coupling Reactions of Compounds of Group 15 and Group 16 Elements (Y. Yamamoto & K. Akiba). The -SF_5, -SeF_5, and -TeF_5 Groups in Organic Chemistry (D. Lentz & K. Seppelt). Polycoordinate Iodine Compounds (V. Zhdankin & P. Stang). Organic Synthesis Using Hypervalent Organoiodanes (M. Ochiai). Hypervalent Compounds of Xenon (V. Brel & N. Zefirov).